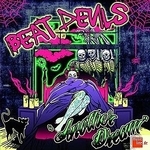 The third album from Moscow maniacs The Beat Devils, one of Russia's leading Psychobilly bands, Another Dream takes the theme of the afterworld - a world of dreams and nightmares. The band's Psychobilly energy keeps the sound fresh, using only three the basic instruments - double-bass, guitar and drums. The concept of the lyrics flows through energetic fast-paced tracks like We Gonna Get It, Nightmare Baby and Run From Your Love.